Save on three legged dog t-shirts in the Tripawds Gift Shop with Cafe Press coupon code, and get more savings in the CafePress.com marketplace with Father’s Day promotions and more coupons. 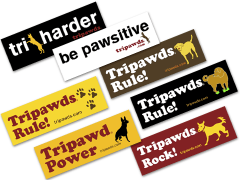 New wide selection of Tripawds three legged dog bumper stickers include front and rear leg German Shepherds, Golden Retrtievers, Labradors, Mutts and more! Don’t miss the new three legged Golden Retriever t-shirts and gifts! I Love My Tripawd front leg Goldie and Tripawds Rule rear leg Golden tripod dog designs are now available on t-shirts, long sleeve shirts, hoodies, sweatshirts, bags, mugs, gift cards and more. 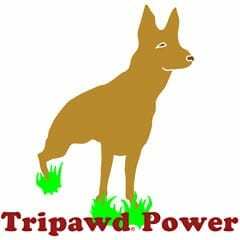 New Tripawds t-shirt design features three legged German Shepherd with missing rear leg inspired by GSD rescue dog Travis available on shirts, hoodies, bags, mugs, cards and other gifts. 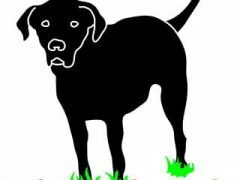 Introducing new three legged black lab t-shirt designs inspired by canine cancer heroes, Ajax, Lalla, and other three-legged Labrado Retrievers of the Tripawds community.